For this month’s Second Sunday Samples episode hajusuuri shares a short recap of the event she attended and gives you an opportunity to win your own mini-swag bag of fragrant goodies. What does cheese have to do with perfume? Nothing! The point is the joyful nature of the commercial jingle is how I feel about receiving scented product samples, perfume samples in particular. Imagine getting over 60 samples in one day! This is how I will always remember Sniffapalooza Spring Fling 2018. This spring’s Sniffapalooza, held April 27-29, 2018, was quite the low-key affair, as compared with my first Sniffapalooza in 2014 (read all about it here); however, this did not diminish the delight of discovering new perfumes, revisiting old ones and meeting friends both new and old. Since my new iPhone 8 did not take very good pictures, you can see event photos at Sniffapalooza.com. 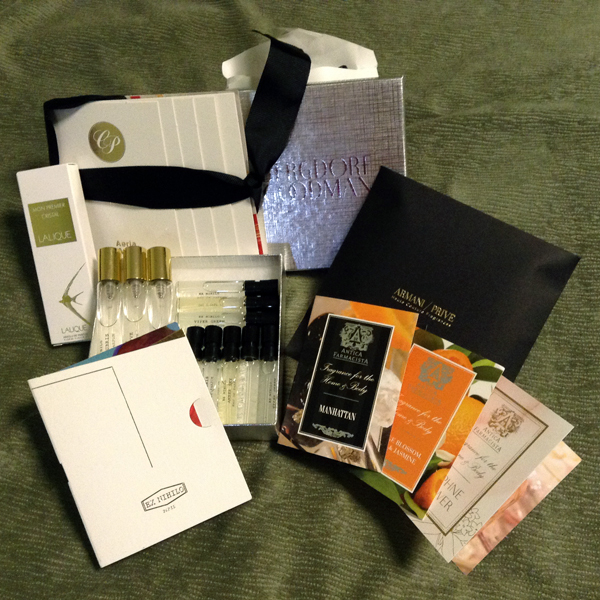 Sniffing at Bergdorf Goodman (BG) – While I can visit BG any day, sniffing during Sniffapalooza day feels special because the SAs seem to be more welcoming and generous. Among others, Ex-Nihilo (3 travel sprays and 8 atomizer samples) and Armani Prive (custom selected by me) were over-the-top generous. 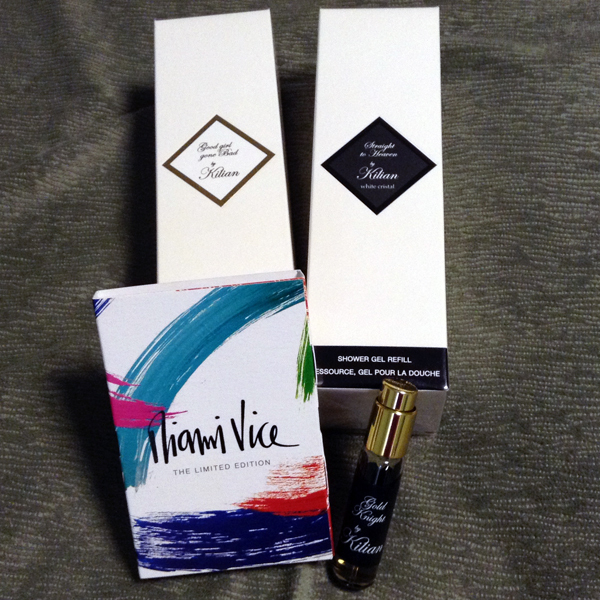 I ended up getting two shower gels from Kilian and I received the new Miami Vice sample set (Love the Way You Feel and Love the Way You Taste) and a travel spray of Gold Knight. I actually liked Woman in Gold better but they ran out of it. What’s a girl to do? I got one from eBay (thanks to the Unseen Censer’s sharp eyes) AND took advantage of a coupon and ebates special at Saks and got myself a travel spray set. 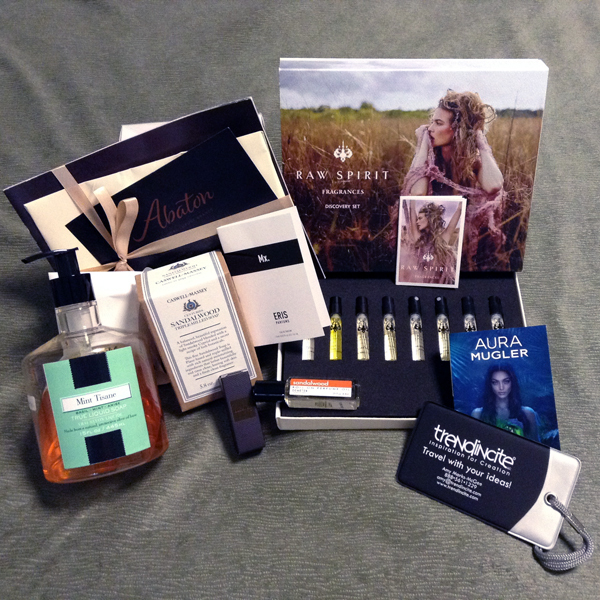 Barbara Herman / Eris Parfums – she highlighted the gender neutral Mx., a sample of which was included in the goodie bag. No flowers were harmed in the making of Mx. It is office-friendly and, on first sniff, is likely to rise up to my FB list. I will wear my sample to see how it goes. For a review of Mx., visit Megan In Sainte Maxime. Jon Bresler / Lafco New York – How closely do you read the ingredients list of your body products? If you are like me, probably not often enough. He practiced what he preached by including a 15 oz. “sample” of Lafco olive oil based liquid soap in the goodie bag. As you can see from the picture, I have already started to use it (I filled another soap dispenser with the soap). The scent I got was Mint Tisane and it has a pleasant minty smell. I am going to try the Champagne scent next. Mary Ellen Lapsansky / The Perfume Plume Awards – She acknowledged the winners of the 2018 Perfumed Plume Awards announced on April 11, 2018. I encourage you to read the winners and finalists’ work and perhaps it will inspire you to write something perfume-related and/or nominate a well-written work. Visiting the Diptyque Boutique – Located at 971 Madison Avenue, the Diptyque boutique is way uptown, between 75th and 76th Street. We were greeted with mimosas and mini cupcakes. After indulging in the refreshments, I got down to business with sniffing. I liked the newest fragrance (Tempo) enough to buy a bottle on the spot! Then I spotted 34 Boulevard Saint Germain soap and a tote bag and I bought those as well. With these purchases, I received a travel-sized spray of Fleur de Peau, 2 candles and a bunch of samples. I’m eyeing 34 Boulevard Saint Germain in Black for FB purchase but I will test the perfume on skin first before making a decision. Cocktail Party / Antica Farmacista at Bergdorf Goodman – As often as I’ve been to BG, I have never gone beyond entering from the street level and heading down to the beauty floor at the lower level. The Decorative Home Décor 7th Floor is a visual and olfactory delight; I will spend more time there in the future, as there are many nooks and crannies to explore! As to the Cocktail Party, it was held in a nice alcove with home scents galore. The featured home fragrance was Daphne Flower, delicately scented. A special Daphne Flower cocktail1 was concocted for the occasion. I would have bought the newest product, a car diffuser, but my 4 year old car still has a new car smell, which is the best smell a car could have, in my opinion. My favorite from this line is what I am currently using at home year-round – Vanilla Bourbon Mandarin. Shopping at Hermes – This was not on the itinerary but I wanted to smell the new Hermessence. There were only two available for sniffing: Agar Ebene and Cedre Sambac. The SA was uncharacteristically stingy even though I bought a bracelet, but nevertheless, I came home with said bracelet, a sample each of the two Hermessence and two each of Eau de Citron Noir and Twilly. That’s it for this edition of Sniffapalooza! 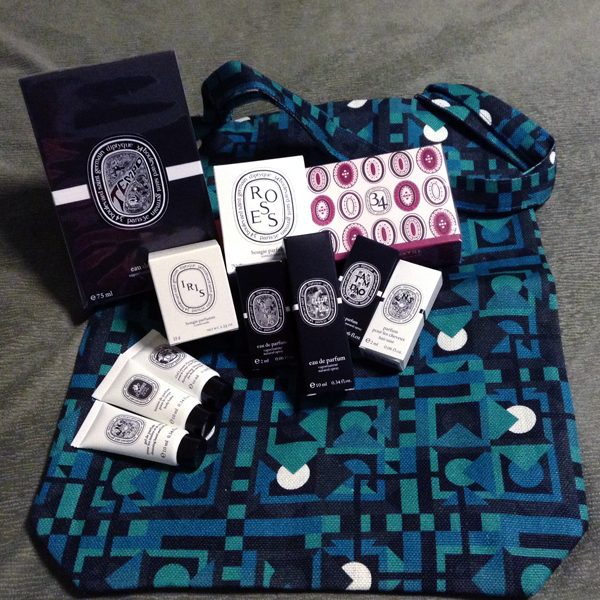 To thank you for your readership, I am giving away 2 packs that include: manufacturers’ samples I received from the event, extras from other sniffing adventures AND a 5mL decant of the newest addition to my collection – Diptyque Tempo. All you have to do is leave a comment with the perfume that is on top of your To Buy List and the country where you live. Anyone in the world can enter. There will be one winner from the U.S. and one winner from the rest of the world. You have until 11:59 PM PST on May 20, 2018 to enter the draw. Neither Undina nor hajusuuri is responsible for lost packages. This entry was posted in Meeting People, Perfume News and tagged Sniffapalooza. Bookmark the permalink. Woohoo Hajusuuri, this sounds like so much fun! It surely is quite a different experience than Esxence or Pitti because you walk from one place to another with a bunch of other fumeheads while at both of these fairs you usually walk around and smell alone or just a friend or two. I wish sniffapalooza like event was organized here or that I could join one of those events in the future. From the stuff you got/tried I’m most interested in Diptyque Fleur de Peau and Tempo although I’m scared if that last one is a patchouli bomb I might find meh. I say come on over to this part of the world. Is there a business trip to the U.S. in your future? There’s nothing to be concerned about with Tempo but I have built a tolerance for patch although I am far from being a patch head! Fleur de Peau was quite light but I need to do a proper wearing of it without interference from other perfumes. I doubt about a business trip but who knows. I’d like to try both when I get a chance. Lucas, you should definitely try Tempo. But don’t make the same mistake I made: do not try it on paper – it really needs skin. Sounds like loads of fun. One of these years I will participate. Mx would be on the top of my “to buy” list as it is the only fragrance my SO has recently commented on liking. However, if I were to be blind buying both Tempo and Fleur de Peau would be on that list as well for they both sound like something I might like. Hello dearest, where have you been??? How was the birthday? As to Mx., I was actually surprised at how tame it was, but then again, I still need to do a proper wearing. If and when I ever get to sniffa I am going with you !!! What a fabulous day! Thanks for sharing it with us, Hajusuuri. It’s amazing what a difference an organised event can make to the SA’s hold on those elusive samples. How cool to hear from Barbara Herman too. Quite unbelievable that Hermes were still stingy even though you bought a bracelet! I’m dying to try Cedre Sambac again. Thanks for the draw. I am in the UK and at the top of my To Buy is No.19 edt. Yay! You’re in the draw, Tara! So far I’ve only managed to make the Saturday events and sometimes the evening before if the venue is easy to get to, such as Twisted Lily (conspicuously absent this time around). I also did not get to BG until later as I stopped by the office to get a little bit of work done. As to Hermes, a pox on the SA for her stinginess. I will go back at some point to lament the lack of generosity to see how many samples I can wheedle out of another SA. I’m looking forward to a proper wearing of Cedre Sambac, especially because of your enthusiasm for it. Thanks, CQ! I have a hard time restraining myself on the spot. The Karens did a great job of working with the boutiques to reward people who stimulate the economy. As to Hermes, this was probably the smallest samples haul after a visit with a purchase. I will go back and cry foul at some point in the near future. Wonderful report! I love your bracelet – were you planning on buying it, or was it a spontaneous purchase? I’d love to know what you think of fleur de peau. My “to buy” list is ever-changing, but I just lost an eBay auction for Tom Ford Champaca, so I I’ll say that is still on the top of the list. Thank you, coin-op. A bracelet was a planned purchase but I did not decide on which one until I tried on about 20 of them. Fleur de Peau was quite light on me but it could have been due to olfactory fatigue. In any case, once I have a proper wearing from my fabulous GWP travel spray, I will report out either here or on NST. I have a decant of Tom Ford Champaca which I got from a split on Basenotes. There’s guy who does a lot of Tom Fords so maybe you can try your luck there? So jealous that you can attend such events. Sounded like a really fun day, although I agree that buying a bracelet at Hermes ought to have earned you samples of everything! I’m not sure what’s on my buy list. I just bought a travel spray of Shangri La, which had been at the top for a month or two. I did receive a sample of Isabey Fleur Nocturne with the Shangri La and liked it on first wearing – and the bottle is beautiful…. I am in the US. It was a fun day for sure and it felt more personal with a lighter crowd. Are you close enough to take a train in and stay in town overnight? As to Isabey, I have Lys Noir in a smaller not as blocky bottle. I think Fleur Nocturne is very beautiful. Thank you for the description of the event. I went once, about 8 years ago and had such a good time, and yes, the large bag of samples was absolutely thrilling! I hope the low numbers attending aren’t a trend. I have hopes to attend again one of these days. On my to buy list is Tom Ford Fleur Vert. I would like to grab it before it disappears, since I think it was from one of the limited edition lines. In just 4 years, things have changed drastically with Sniffapalooza. Part of me liked the smaller group but it did feel like it was a harbinger of things to come, but I hope not! Tom Ford has a track record of discontinuing the good ones…like Amber Absolute (I got a small bottle when it made a reappearance several years ago). Love that bracelet! But what’s with the stinginess??! After reading this, do you think that Sniffa is running out of steam? They really haven’t updated the format and actually have lost some of the highlights over the years. Or do you think there are other reasons for smaller attendance this year? As to Sniffa, I think it needs a new headline to draw people back in again. Twisted Lily was noticeably absent from this episode – no Friday event there and not even one dabber sample with coupon! Should I include you in the draw? Hey hajusuuri, thanks for sharing your stories from Sniffa! I especially love all your photos :) I hope to attend someday, though it sounds like an almost overwhelming amount of sniffing. I’m thrilled you found a few FBW loves! At the top of my to-buy list are Tauer Incense Rose and l’Artisan Parfumeur Passage d’Enfer. Thanks for your generosity :) I’m in the US. Thanks, Koyel. I paced myself and did not get overwhelmed . Normally, I would try to fit in a Barney’s visit (on my own) and a stop at Molton Brown but I skipped these two in favor of Hermes, a quick stop at Annick Goutal which I probably should have mentioned above (but didn’t because I only ate two macarons, stayed for the brand story talk and then slipped out to Diptyque just up the street. What a fun event! And certainly sounds like you enjoyed it. At the top of my list is Clémentine California by Atelier. It was certainly a fun and I hope you get to experience it some day! Clementine California is a good one – great for the summer. I would love to go to the Sniffa one day though mostly for spending time at the event and meeting the like-minded people because if to count the price of the trip, I could buy all of the samples several times and then some ;) But I’ll try to coordinate a visit to my family with one of these one day. About the samples stinginess: I was just thinking about it the other day! As I was buying perfume as a gift at the Jo Malone counter at Nordstrom (! ), I had to actually ask twice to get several samples added to the purchase – so that my friend could try more of their perfumes at her leisure. I remember times when buying anything would just shower you with those samples without you even mentioning anything. Of course, back then there was not such a great eBay market for those “free samples” ;) But I would have expected more from Hermess! I see that you got yourself that sandalwood soap that I was just raving about recently (soap on a roap). I wonder: is it an updated packaging, or a promotional item? Thank you again for the opportunity to guest post! It would be a highlight for you to be at Sniffa! As to the Hermes samples, it was a bummer. I will go back at some point to acquire more. And your comment about the samples popping up on eBay instead of being given to shoppers is spot on. Having seen the Nordstrom in Vancouver, mine now looks like a mom and pop store. We don’t have Jo Malone other than a few random bottles. During Fragrance Week in April, we had a very limited selection of Kilian perfumes so may be there is hope that we may get some new brands! The Sandalwood Soap packaging did not have any marking indicating that it’s a sample so I’m thinking that it is updated packaging. It smells nice through the little hole cutouts. And….congrats on the BdI and Iris des Champs. Does the iris des Champs smell the same as what I sent you? My closest local Nordstrom suddenly had several random Le Labo bottles. I made several samples to try those that I didn’t try before on skin (I still haven’t tried them). The second local Nordstrom has the complete Tom Ford line, which is nice since I can make samples if I want to but since the same plaza has Neiman Marcus and Bloomies, it’s not that impressive. But both have the full Jo Malone range. I will report back as soon as I get the bottle: I actually just bought it two days ago. I hope you’ll like the soap: I bought the third one right after I wrote about it – but my second one is still going – month 16 or 17. It’s impressive. I miss going to Sniffa. Those trips were a blast but with money being tight these past few years I just couldn’t go. They also seem like the price has gone up but there’s not as much on the schedule or in samples. I love your recap of the event. One of these times I’ll get back there. Poodle!!!!!!! It had been forever since I saw you posting anywhere unless I don’t frequent the blogs you read! It is good to see you here. Sniffa Spring Fling was a shadow of its former self and I hope the Karens can bring more life back into it. Selfishly, I actually liked the lower turnout better as the venues were less crowded. Put me in the draw. Please. I’ve just been lurking, not posting. I imagine the small crowd would be nicer in a way. They were late getting the dates out last few times too. If you need to travel that timing affects things. I love 34 boulevard Saint Germain! A wonderful perfumista sent me a sample, was it you? ;) I can imagine the soap is fabulous. I also love your new bracelet, so very elegant. Thank you for sharing the Sniffa highlights, it is wonderful to see and feel the perfumed excitement. Please do not enter me in your generous draw as I have been a lucky recipient of your generosity in the recent past! I will play along and share that my most recent top of the list full bottle lemming is the new Meteorites. I am on a strict “no-buy” since January 1, so it is fun to put that one on the list knowing that I will probably never smell it unless I blind buy and at the same time feel safe that I won’t blind buy because of my no-buy, ha! How’s that for perfumed mental gymnastics. Ay-yi-yi! Hiya tiffanie! I asked the Bergdorf SA for a sample of Meteorites and she made me one. I haven’t revisited but my initial impression was it smelled generic. We’ll see,if it redeems itself from an actual wearing. I may have included the original 34 boulevard Saint Germain in a goodie bag…the one I liked quite a bit at the boutique but restrained myself was the newer black version. I’ve worn the bracelet quite a bit. Black and white goes with a lot of colors! Thanks for the write up–it sounds like fun. I would love to go to sniffa, or some other sniffing excurson and gathering of the perfumista clans. I’ve been acquiring FB and partial bottles of Bruno Fazzolari. I started with Lampblack, the Feu Secret, then a partial bottle of Ummagamma and then I am waiting to get my partial bottle of Unsettled to arrive! I’m still bitter about the stinginess of the Hermes SA. What a great event! The first time I have heard of it. Number one on my to-buy list is Guerlain L’Homme Ideal Intense. I enjoyed the event even if it was a shadow of its former self. I have to sniff that L’Homme Ideal Intense given your discerning nose likes it a lot! SunnyDay! I hope you can make it to Sniffapalooza! Does Fragrancenet ship to Canada at a reasonable price? If yes, you may be able to get Bois d’Iris at a great price! Well this event sounds like a lot of fun.And WOW at the samples haul!I love your bracelet as well.On my next-to-buy list is definitely Frederic Malle Music for a while.Cannot wait,and Kevin’s review nailed it for me as a must-have pineapple scent.Thanks for the generous draw.I am in South Africa. Hello Johanob, a lovely Frederic Malle store manager sent me a sample of Music for a While. I wore it once but probably not enough and didn’t think much of it; however, I shall re-try and empty out my atomizer and see how it is with more spritzes. thanks for the report – sounds like a fabulous day. I didn’t even know this event existed until I saw mention of it on NST. My next FB – perhaps Safran Troublant. But I’m fickle, and easily distracted (I cannot otherwise explain why I now own an adorable bottle of Dune), so who knows? eschmeling! There is only one way to cure that fickleness – just get it! Safran Troublant is FB for sure (I have a back-up bottle) and one should buy the largest size because it is 8 sprays per wearing to last all day. And Dune – Wow. I love it, too. My bottles are auction and online site vintage and they are fabulous. DNEM but I am madly in love with your Hermès bracelet. How luxurious for you. Hello back at you, Portia! I’ve worn the bracelet many times since I bought it as black/white/silver are easy colors to match. My next one (probably next year unless I decide to give myself a gift from me to me for Christmas) will likely be rose gold. Hope to see you in this part of the world soon! I am in the US and would love to be entered in the draw! My most recent FB purchase was Fleur de Peau, but I have not tried Tempo. Right now Hermès Mediterranee has made it’s way to the top of the purchase list. It’s my favorite of the Jardin series and temps here have finally gotten warm enough that I am thinking about summer perfumes. Sniffa sounds like so much fun! I wonder if there is anything similar in Chicago? Ha! I have somehow managed to create a new comment instead of replying. Please see below. Hello dear Hajusuuri, I remember fondly first meeting you at a Sniffa a few years ago. My no buy budget has kept me away, and I have limited myself to swaps and free samples. 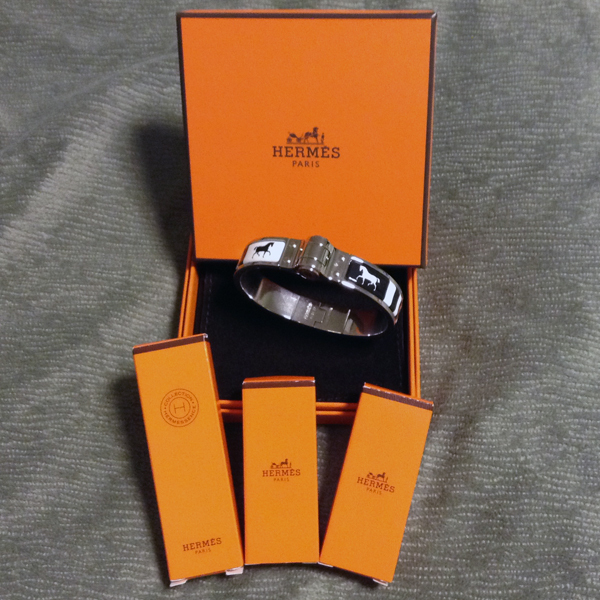 I am always happy to test anything from Hermes. Do include me in your draw, and I hope we will sniff together in the future. Hey jepster! That was so much fun and you won the basket of perfumes! That may have been the last or second to the last year that they held breakfast at BG. As to Hermes, boo hiss on their stinginess. Hey madtowngirl! Everytime I see your name, I automatically have “Uptown Girl’ in my head. Tempo – I am in love with it…my SOTD today. Not a patchouli bomb at all and strangely, it smells to me like an upside down Volutes EDP.